My son loves sea creatures, and so do I. Finding Nemo has become a favorite movie in our home, and we are super anxious for the new release of Finding Dory. We're even in the process of converting his room to an ocean theme. 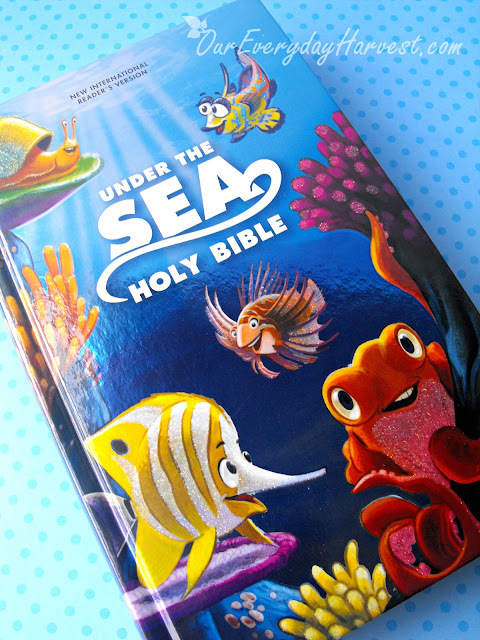 That's why I was extremely excited to hear that Zonderkidz was releasing an Under the Sea Holy Bible. 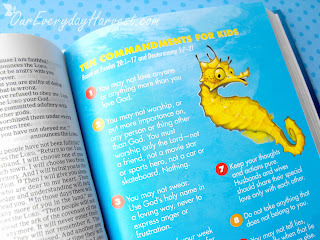 There were some things that I really enjoyed about the Under the Sea Holy Bible and some things that I felt were lacking. The Bible has a beautiful hard cover with glitter accents and colorful illustrations of various sea creatures. Inside, the pages are fragile and thing–somewhat reminiscent of an adult Bible. A presentation page, perfect for gifting to someone. A Books of the Bible page which breaks down into categories such as Law, Gospels, Church History, History, Letters, Poetry, Major Prophets, Minor Prophets and Prophecy. Each of these pages contain precious colorful illustrations of sea creatures. Some of them were so nice, I would have loved to receive extra prints to frame and hang on my son's wall (especially The Lords Prayer and Ten Commandments for Kids pages). The back of the Bible also contains a list of Great Bible Stories and, as well as a dictionary. The New International Readers Version (NIrV) is a wonderful translation for kids, since it's easy to understand. 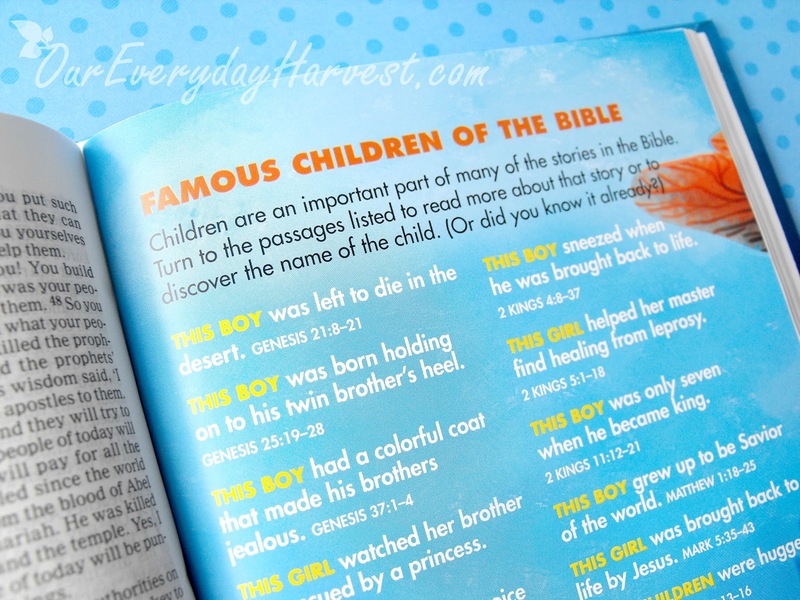 The Under the Sea Holy Bible was created for children ages 6 to 10. Having said that, I do feel that this would be better suited for the higher end of this age bracket. There are only a few pages in this Bible that really show illustrations of sea creatures. Younger children who receive this may expect to see more images. Older children might not mind so much. I guess it really depends on the preference of the child. All in all, it is a really nice Bible. My only complaint is that I would have liked to see more images relating to the whole ocean theme. If you are looking for a Bible that contains more illustrations, then this might not be the one for you. However, if you are looking for a sturdy, easy to read Bible for an older child, then I would definitely recommend the Under the Sea Holy Bible. To be honest, I don't recall seeing many ocean themed Bibles on the market, so either way this would make a beautiful gift for little sea lovers everywhere. 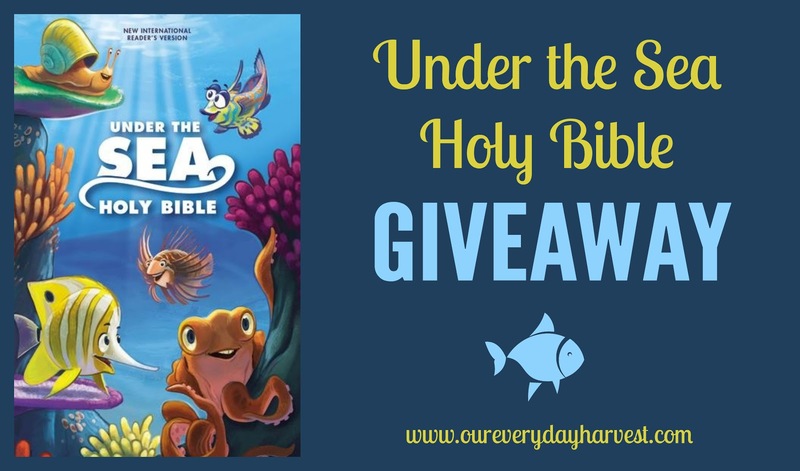 Would you like to win a copy of the Under the Sea Holy Bible? I happy to announce that I am giving one away right here!